SINGLE INGREDIENT AND ALL NATURAL - Single ingredient, made in Brazil , oven baked to perfection to bring out its natural flavor. Our Pig Ear strips chew treats for dogs are hormone free, with no Artificial Flavors, Additives, Preservatives or Colors. 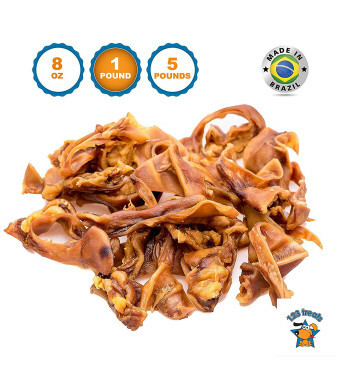 SATISFIES DOG'S CHEWING NEEDS - Dog chewing 123 Treats Pig Ear strips chew treats can help divert your dogs attention away from destructive chewing behaviors and encourage a new positive chewing habit. Always supervise your pets when enjoying any chews, treats or bones. SAFE & DIGESTIBLE - 123 Treats Pig Ear strip treat chews are softer than bone and cartilage which makes it easy to digest. It contains no bone so no risk of crumbling or splintering, so you can feel safe offering this yummy treat to your dog. 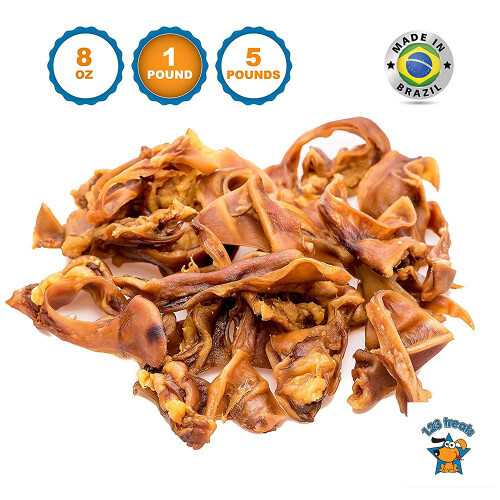 PERFECT FOR ALL SIZE DOGS - 123 Treats Pig Ear strips treat chews are the perfect training reward for your dog. From puppies to senior dogs, our tasty Pig Ear strips chew treats make a great daily snack treat chew. SATISFACTION GUARANTEE: At 123 Treats, we want you to be 100% satisfied with your purchase. That is why we offer our 30 day satisfaction guarantee! If you are not happy with your Pig Ear Strips order, our customer service team is ready to help. With a great selection of Dog Chews, Dog bones, Hooves, Beef Treats, Bully sticks and more, we are confident we will find something to suit your needs. Our pig ears trips are 100% natural. These oven baked treats are rich in omega 3 and 6, improving quality and health of your dog's skin and coat. 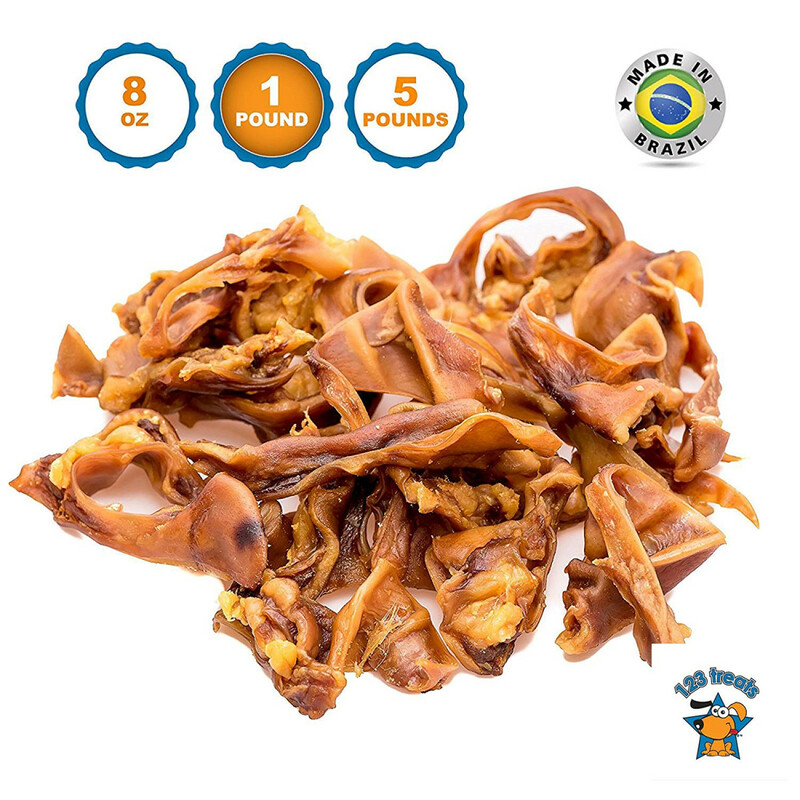 Our pig ears trips are rich source of protein and essential nutrients, providing natural and heath energy to your dog, while being easy to digest. Recommendations: Only use as treats. Recommended for adult dogs. Make sure that the dog has fresh water at all times. Our pig ears strips come from Brazil.